The 61st Annual Grammy Awards took place on Sunday night, and it was A LOT. There were countless no-shows, star-studded tributes to musical legends, and Alicia Keys played two pianos at once. Not bad for a Sunday night. I've rounded up some of my favorite moments (and some of the biggest) in the following list, in no particular order. When Cardi B Made History Winning Best Rap Album For "Invasion of Privacy"
Cardi B became the first solo female artist to win the award. Her acceptance speech was full of raw emotion, and a lot of shaking. 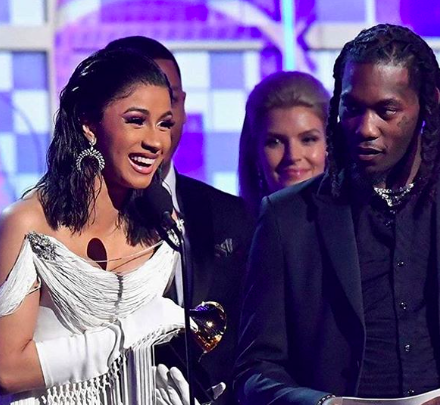 Led onstage by Offset, her husband and member of the rap group Migos, Cardi joked that she "should probably start smoking weed," after confessing how nervous she was. This was the Bronx rapper's first Grammy win; she made her Grammy debut only one year ago when her breakout hit "Bodak Yellow" was nominated for two awards. "Invasion of Privacy" topped the charts throughout much of last year, breaking records and launching Cardi into rap stardom. Clad in a bejeweled bodysuit and accompanied by producer Mark Ronson, Lady Gaga performed the hit song from her recent film A Star Is Born. The performance may have been "scaled back" in Gaga terms -- the song is somewhat of a departure from the pop anthems that characterized her early career -- but it was nonetheless her own. The most captivating part of the performance occurred at the very end, as an expressionless Gaga stared straight into the camera without blinking for what seemed to be an eternity. It became the subject of countless memes overnight. It's hard to tell whether Drake's acceptance speech was really an acceptance speech. The popular rapper won Best Rap Song for "God's Plan," his longest-leading No. 1 single on the Billboard Top 100 chart. 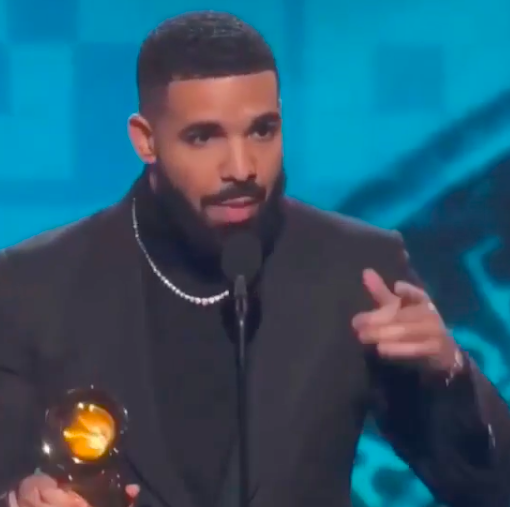 After taking the award from the presenter, Drake emphasized how little a Grammy meant to him: "Look, if there's people who have regular jobs who are coming out in the rain and snow, spending money to buy tickets to your shows, you don't need this right here...You already won." His speech was then cut off by a commercial break in an ironic turn of events that garnered plenty of headlines. Drake's criticism of the Grammy's isn't surprising: it comes in the middle of a long battle between hip-hop and the awards show, which consistently fails to give the genre the recognition it already receives in pop culture. Ariana Grande joined many of her fellow stars when she pulled out of performing at the awards show just days before it was set to air. A dispute with the show's producers was reported as the reason for her absence. However, unwilling to miss out from the hype, Grande posted a series of photos on social media wearing the custom-made Zac Posen dress she would have worn on the red carpet. The first photo garnered 5.6 million likes. In essence, Ariana Grande single-handedly upstaged the Grammys. The "Thank U, Next" singer ended up winning Best Pop Vocal Album for her "Sweetener," released last August. She accepted the award with a tweet. 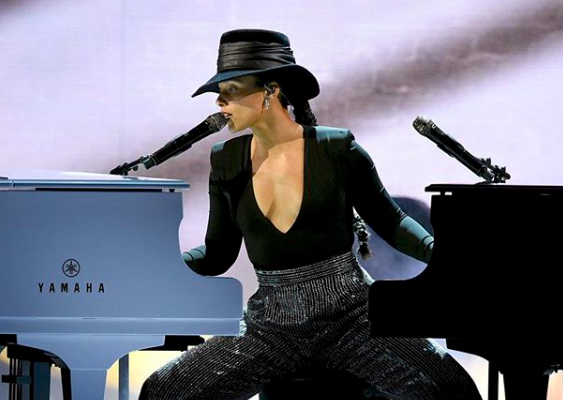 This year, 15-time Grammy winner Alicia Keys hosted the awards show. In a little over six-minutes, Keys welcomed the Grammy audience to "Club Keys" and captivated every viewer with a medley of songs that inspired her, singing hits from all decades and genres, from Juice WRLD to Lauryn Hill. The most notable parts of her performance came when she played two grand pianos at once, a tribute to the late Hazel Scott, a classical pianist from Trinidad who gained national attention for her skills in the late 1940s and 50s. Last April, former Recording Academy President Neil Portnow set off a firestorm when he told Variety magazine that women would need to "step up" if they wanted more credit at the Grammys. (During last year's awards show, Alessia Cara was the only woman to receive a solo award). After a petition was created calling for his removal, Portnow left his position as president, and the Academy has been making up for his comments ever since. 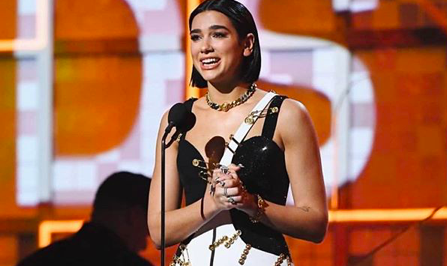 The controversy was once again put in the spotlight this year by pop singer Dua Lipa, who won the awards for Best Dance Recording ("Electricity") and Best New Artist. During her acceptance speech for the latter, she called out the former president: "I just wanted to say how honored I am to be nominated alongside so many incredible female artists this year, because I guess this year we really stepped up!" It became a gratifying moment for the many women who won awards that night.